The people of Thailand, living in a monarchy where democracy is yet underdeveloped, used to express their political views by donning a T-shirt. I won’t go into the meaning of this gesture, except to say it is very powerful. The sea of yellow and red allow people to identify with a standpoint at a very low-cost (everyone owns a red or yellow top). The impact of a colour when everyone is wearing it is profound. You get a real sense of the multitude and, if you are powerful, it can be intimidating. 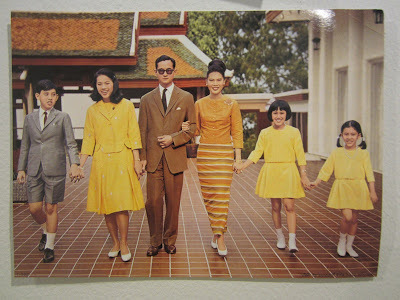 The Royal Family has previously worn a lot of yellow – here is a charming, vintage picture of the current ruling family from the 1960s. I love the traditional Thai ladies suit, usually made with local hand woven silks, with the full length skirt and closely fitted jacket. On slim, elegant women with enormous poise they really help create a sense of calm in a beautiful country. Various agencies and organizations, as well as the general public, have been invited to display on their offices and houses a purple flag with the ceremonial emblem on the celebrations from 1 January to 31 December 2015. 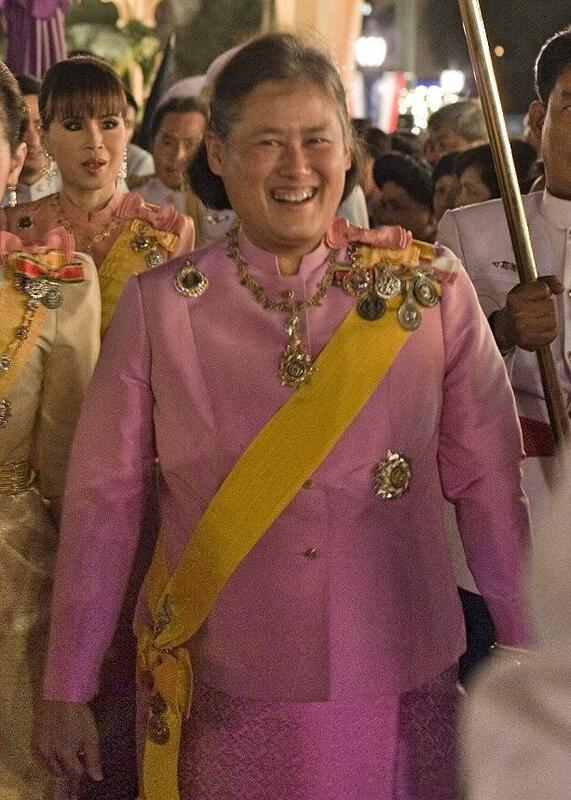 Purple is the color of Saturday, the birthday of Her Royal Highness Princess Maha Chakri Sirindhorn. The public will also be invited to wear purple shirts, with the ceremonial emblem, as an expression of love and respect for Her Royal Highness. Of course politics are colour coded everywhere. In the UK the traditional divide is between blue for the Conservatives and red for Labour. In America the Democrats are blue, and Republicans are red. Obviously Green politicians normally adopt green as their colour. The Liberal-Democrats in the UK have yellow, as do our Scottish Nationalists, with the UK independence party going for purple. In Ireland the Republicans favour green, where the Loyalists adopt Orange. Many Dutch people wear Orange too when supporting their national teams. Colour is a powerful signifier and wearing the wrong colour in the wrong place can get you into serious trouble. The Homes for Britain Campaign has adopted magenta and black. This week a huge rally was held in Central London to call on the political parties to do something to address our housing crisis. So, as a committed participant, I dressed up for the event. Here I am on the campaign bus. It looks great! I’m curious to know more about the campaign. Don’t you just look perfect hanging unto that bus? What a great advert for the cause and love your outfit! The photo of you is wonderful, in your beautiful new outfit. Go, K! Wonderful that you can fight for what you believe in! Group colour really does have a visual impact. I work for a sportswear company and later this year it’s the world cup. I’ve spent the best part of the last 12 months working on the jerseys the supporters will wear and just before I logged on I was discussing how excited I will be to see the stadiums full of fans wearing their team colours. I hadn’t thought about the application to sport Helen, but of course it is so true. Thank you! Maybe a topic for another post…. What a great picture – it would also be an eye-catching option for a campaign poster!